With the authorization of the original author (Jeroen Pelgrims) of SoundSwitch, I have taken upon myself to update and provide support for SoundSwitch. You can see the version in the About page when right clicking on the icon. [Major] New Configuration file for SoundSwitch in JSON. 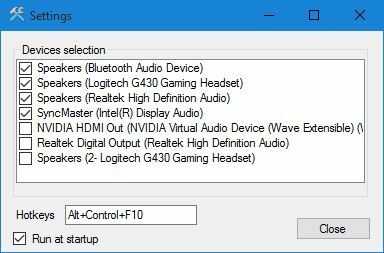 Audio Devices are sorted by selected or not in the Settings page. One of the biggest change with the previous version is the use a of library I forked to access easily the audio devices of Windows. With this library, SoundSwitch doesn’t use the old EndPointController.exe to gather the list of Audio device and set the default one. I created a C++/CLI wrapper to be able to use it natively into C#. It was quite a lot of work for me since it was the first time I used this “language” compared to the barebone C++. I’m providing an installer created with Inno Setup (the code for it is available in the repository). With this Installer creator I’m able to easily make an installer that checks for .NET 4.5.2 and Visual C++ Redist 2015. Those 2 modules are required to make SoundSwitch works. I have been using soundswitch on my personal pc for a year of so. Recently I tried to install it on the work pc, and it simply does not work. The process is running, but no tray-icon i present, making it impossible to use. I have installed the required dependencies. Could you add which version you are using ?